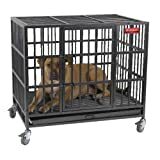 The Pro Select dog cage is specially designed to be indestructible even when housing an aggressive dog. It is heavily built to be powerful than other cages in the market. The cages frame is skillfully forged using 20-gauge steel bars, which have been further reinforced using inch tubes of steel for strength and sturdiness. 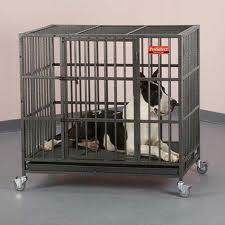 Dog owners will be delighted especially if their pets are fond of chewing their way out of other types of cages. The cage’s welding is heavy-duty at all stress points, in addition to, double door latches for enhanced strength. Four casters have been mounted on the Pro Select Empire dog cage for increased mobility. 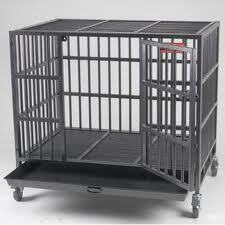 The casters are lockable and removable to ensure that the safety of dogs is guaranteed when the cage is stationery. 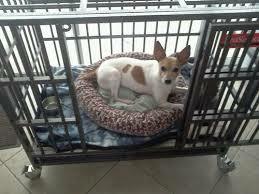 A removable stainless steel tray is placed at the bottom of the cage for dogs to lie on. The fact that the tray is resistant to corrosion and its removable nature for cleaning ensure that dogs live in hygienic conditions. Due to the availability of the Pro Select Empire dog crate in two sizes, dog owners have the ability to select the size of the cage in relation to the sizes of their dogs. The crate is available in two attractive colors to offer dog owners a choice of the desired shades for their dog’s surroundings. The greatest and most notable advantage of the cage is that it is virtually indestructible by the most aggressive dog. This results to savings due to the fact that many pet owners frequently spend money on cages, only for their pets to destroy them in the search for freedom. The Pro Select dog cage does not need to be replaced due to its sturdy nature. The Pro Select Empire dog crate is very pricey. This is prohibitive to many pet owners because they need to take care of other expenses as well. 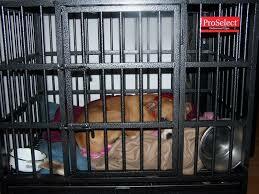 Puppy owners have a difficult time keeping their pets inside the crates due to the large distance between bars. This is inconveniencing because it becomes necessary to make dividers to keep the small dogs in, which is inconveniencing, costly, time consuming and compromises the looks of the cage. Due to the fact that the floor of the cage is not solid, dogs have problems especially when food pieces fall through and become unreachable. There are reports of dogs getting hurt in their attempts at escaping through the steel bars. Many pet owners would actually prefer their dogs to be safe and free to being confined and injured. Many pets have suffered from serious separation anxiety due to the fact that escaping from the crate is not possible. The Pro Select dog cage is arguably the best product in the market when it comes to properly confining aggressive dogs. It is a pricey product but dog owners get a product that is worth the investment in terms of quality and durability. It is a product that is highly recommended for every dog owner.